Last weekend I spent a few days at the Cookville Exotic Animal Auction which is held about every season. I was hoping to acquire a bottle fed female Llama. However, no females were available & I had been warned about bottle fed males so my visit was not fruitful… so I thought. 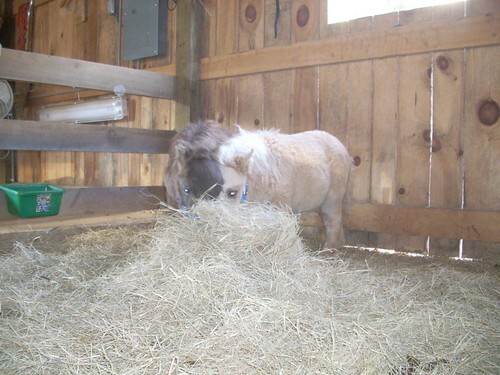 When I returned Friday with Scott, I found 2 little dwarf minis stalled together. I allowed myself to enter their pen and examine them as best as I could with the little amount of knowledge that I have on these little guys. Their legs were not bent, their hooves were relatively normal & the stallion had a slight under bite. Oh but how cute they were! Regardless of his small stature, the little stallion was so “studly” that he would answer to the whinny’s of the larger size horses! He’d lift his head and practically lift his front feet off the ground the return the calls! It was so cute (only because he’s so small). Against my better judgment because I have at least a little knowledge of the negative aspects of owning dwarfs, I found the seller & begged him to sell me these 2 babies bypassing the auction process. To no avail. He had heard of a “freak” scout that was looking to purchase unusual looking animals for his traveling “circus” and like many people, dollar signs were all that mattered. It was a long day… I returned at least 100 times to their stall to just look at them and pray that they’d find a good home. I didn’t return Saturday for the auction… I knew that I’d go head to head with anyone bidding on them and that’s not a good thing. Auctions can be dangerous & I’m well aware how quickly bids can rise. I knew I’d end up spending way more than I wanted to and way more than the value of the dwarfs. To make an already long story short, Saturday the seller called me and offered me the dwarfs. He was unhappy with the bidding & let me have them both for $1500. He expected to make more than $1000 each but the auctioning held at about $1200. He was “kind” enough to deliver them to me. I was so happy, I cried! This gentlemen (from Kentucky), currently has about 50 miniature horses on his farm and he claims he has between 1 & 3 dwarfs a year. His breeding schedule should be examined to stop breeding the animals that are producing the dwarfs. My little ones are of different mares but the same stallion… that should tell him something. But then again, maybe the dwarfs are his cash cow.. so sad. It is very sad that people breed animals for the sole purpose of money and not for the love or responsibilty of what a pet owner is all about. I don’t think you can “plan” to have Dwarfs.. no more than 2 humans can plan to have “little people” children. What’s sad is people that have them and sell them for way more than they’re actually worth (like in my case). This fellow should have been happy to have found someone that actually wanted to care for the little babies. But, who am I to judge? The important thing is that I have them and they’re not in some side show freak show! Not to mention that there were people at the auction that openly said these guys should have been put down at birth!